Starting my day watching C2K 2020 against Meanstreets. G3 Grind and Iowa Barnstormers of the same class going on immediately beside me. 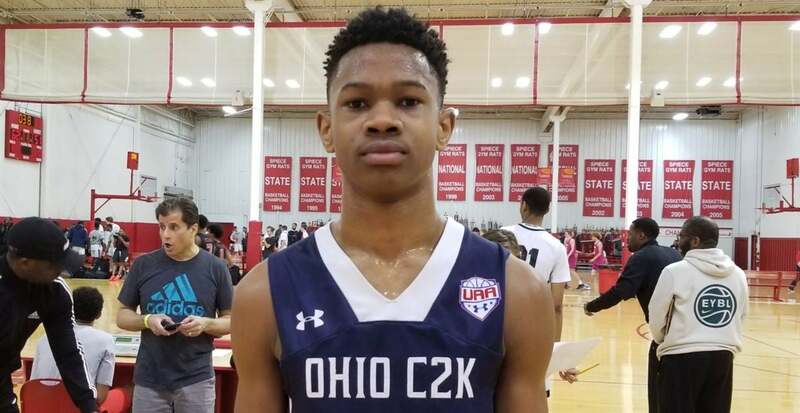 A C2K coach told me Zeb Jackson is getting interest from Butler. 6’3” guard. I didnt see much from Zeb Jackson in the first half. He’s got extremely good length for the PG position. He's extremely long, kind of similar to Baldwin. His handles are a little bit loose but he is extremely quick with them. He’s had a few crossovers than nearly tripped defenders up, although he didn’t end up going anywhere with it. Only took 1 shot and missed it. Saunders has his fingers taped up and hasn’t played much. He just got back and immediately blew by Jackson and got his big man a trip to the line. Jackson just returned the favor to get himself to the line. Jackson reminds me a lot of Eric Hunter. Maybe that’s why I like him so much, as I really wanted Hunter. He’s got a lightning quick crossover than Hunter doesn’t have, and he’s broken it out a few more times here. He’s missed his jump shots in this one though. I just copied over some posts about Jackson into this thread from what I saw at Run N Slam. Overall I absolutely love him. The more I saw him the more convinced I became that he's the type of guard that should be a primary target for Butler in the 2020 class. He's a true combo guard that I'd predict will end up being a 4 star. I think he can crack the top 50. He's got the length to defend off the ball and the lateral quickness to defend point guards. Jackson has a lightning quick crossover that he uses frequently to get anywhere on the court he wants. He was one of the best defensive guards I saw in his class, and his offense is just as good as his defense. He didn't shoot the ball particularly well from the perimeter, but his shot looked smooth, so I suspect that was a fluke. Looks like he is shooting 39% from 3 in the Under Armour association, which supports my thought that he normally knocks down a lot of the shots he was missing this weekend. He's going to have a flood of offers coming in over the next 3 months. I really hope Butler is one of them. He's ridiculously talented and also feels like a good fit. In case you didn’t believe me hyping him, he just got an Ohio State offer. And anyone signing up with an @osu.edu email gets charged $50k per month. bumba, DawgsMD, BUcheer and 2 others like this. Well, yeah. Since OSU has such massive resources to pay anything they want for whatever they want, let them pony up! FRENCH DAWG and PSUButlerFan like this. Just picked up a Xavier offer during his campus visit today. Will also be on an unofficial with Butler today. SpartanDawgs, indienapolis, Mad_Dawg 48 and 2 others like this. How tall is Lavall? Zeb looks to have him beat. Just picked up a Xavier offer during his campus visit today. pjohnsto2003, BHayden and Lukas Harkins like this. No surprise, given he is one of the few 2020 players who holds and offer, but I did confirm that Coach Jordan called Zeb today. BHayden and Daddysmack like this.